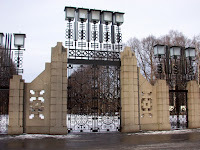 We're giving you a tour through the Vigeland park these days. We started at the main gate and are now walking you towards the Monolith. On our way, we pass a bridge - not over troubled waters - but over a small lake with many birds that you can feed. On each side of the bridge there are lots of beautiful statues. 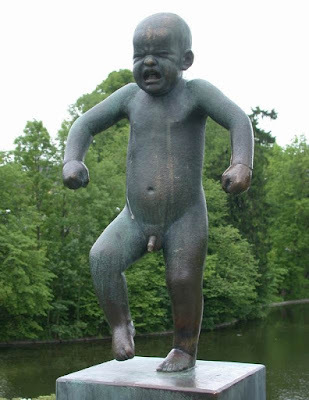 One of these - and the most famous one - is 'Sinnataggen' (The angry boy). Other posts from the Vigeland park. 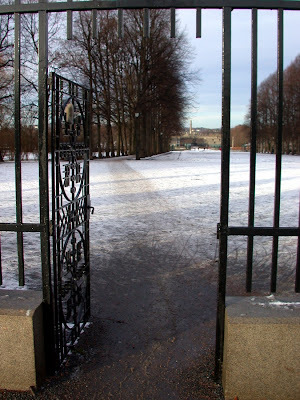 Seems like the Vigeland park was almost empty when I peeked in from the main gate. Where are the tourists? I guess they wait for summer, too. Still - it's a beautiful place at all seasons. 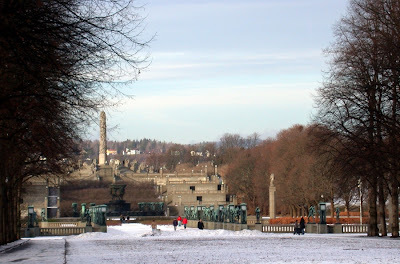 This is from the main gate of the Vigeland park. In the distance you can barely spot the Monolith. 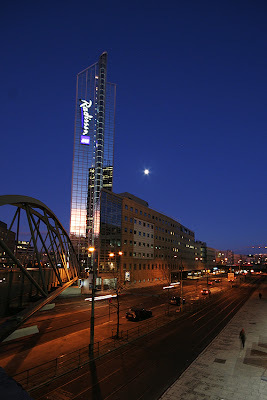 The picture shows the Radisson SAS hotel; Oslo Plaza, and the street called Schweigaardsgate. Need something for your aquarium? At Løren, a part of Oslo not so far from the center, you can find this store - that claims to be Norway's biggest aquarium store. 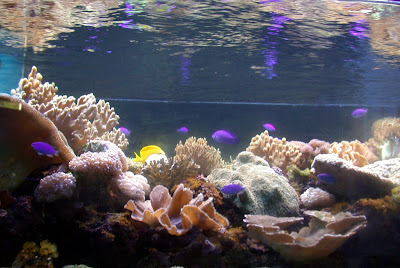 They do have a lot of nice fish tanks and lots of beautiful fish. My father has a quite big salt water aquarium, which is very soothing to watch. Løren is a growing part of Oslo. They're building lots of new apartment buildings in this area. I grew up not far from there and it is a nice place to live. A few days ago, my son and I went to the cinema to watch the Golden Compass. (We liked it!) 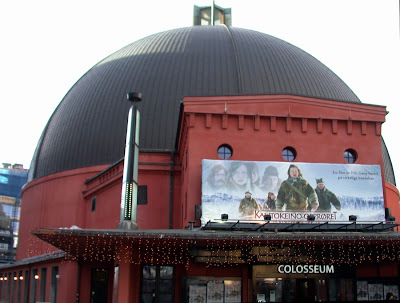 This is the Colosseum cinema at Majorstua in Oslo. 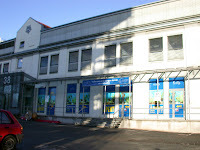 It's the largest cinema in Oslo, and has 4 show rooms. 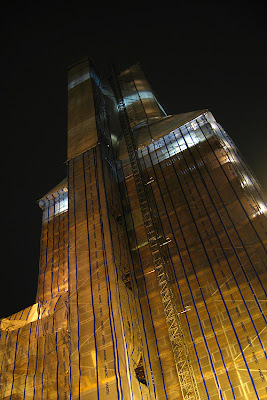 The largest hall has 978 seats and according to what I've read online it is the world's largest THX-certified cinema hall. At the moment the main movie at this cinema is a Norwegian movie called 'the Kautokeino riot' (my translation). I haven't seen it. This is a view from the roof of my building. I love watching the sky when the sun goes down. bigger and more colorful than yesterday! 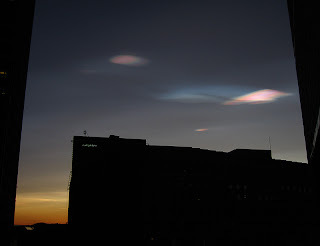 This picture is taken from the roof of Oslo Spektrum. 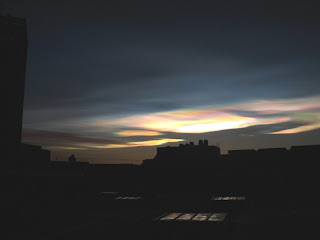 "Nacreous clouds, sometimes called mother-of-pearl clouds, are rare but once seen are never forgotten. 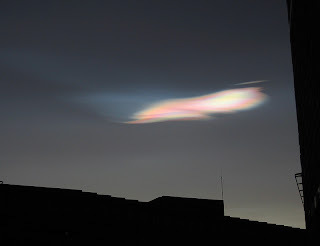 They are mostly visible within two hours after sunset or before dawn when they blaze unbelievably bright with vivid and slowly shifting iridescent colours. 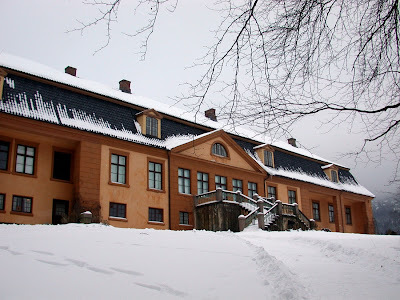 They are filmy sheets slowly curling and uncurling, stretching and contracting in the semi-dark sky....read more"
This is the entrance to the Munch Museum at Tøyen in Oslo. If you visit Oslo I'd really recommend a visit. 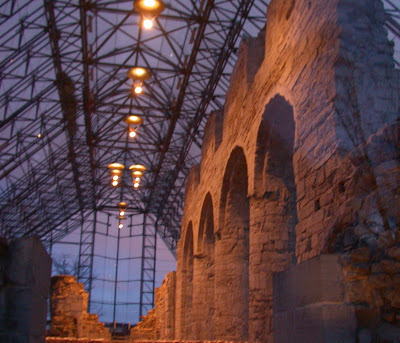 Nearby, you'll find several other museums worthwhile visiting. I'll probably visit them and tell you about them later. 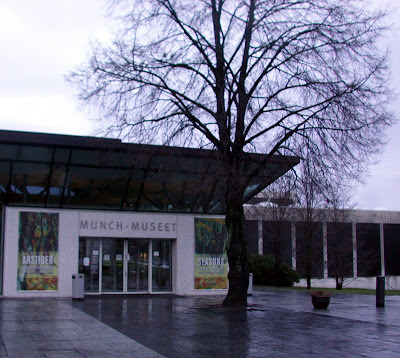 Yesterday, I went to the Munch museum with my son after he suggested it. 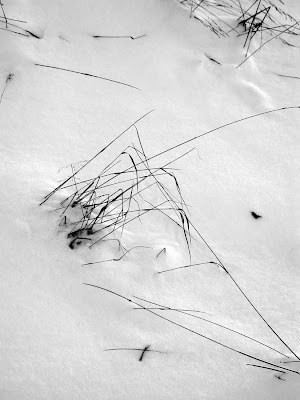 The exhibition they show now is called Seasons - Changing landscapes. It is allowed to take photos, but not using a flash, so this photo is not very good. 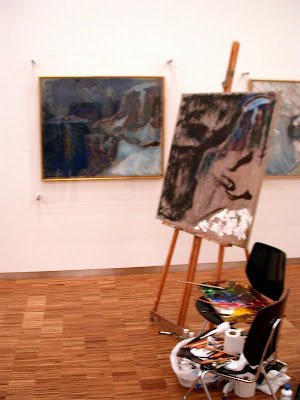 It may seem like Munch is back, as the painting equipment was standing there ready. I asked a guard and he said that he wasn't sure what this was about, but they might be shooting something for TV. The painter was obviously on a break, at least we didn't see him. What we did see however, was Edvard Munch's own recordings; film made by Munch himself. It was not very impressing, but still fun to see the old filming dating back probably a 100 years or so. i'm going to visit olso next week, and m coming from asian country that not familiar with Cold weather, if possible, would you be kind enough to show some photo of people's clothing/dress code during this winter in Oslo, so that i wont be under/over dress. Thank you for the question! I don't have any photos to show you of how to dress, but I would suggest bringing warm sweaters, like woolen sweaters or a fleece jacket. 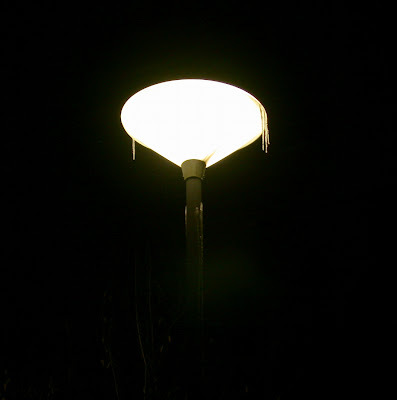 Right now it's not too cold (around 0 C), but you never know how it'll be in a week. We might have - 10 C and then you'll need something underneath the pants as well, like woolen tights/long underwear. And of course, a nice, big warm jacket/coat. Also, bring gloves and something to wear on your head (warm cap), otherwise you'll loose a lot of your body warmth. I found this page that gives some nice advice, also this page, hope that will help you! The 'dressing in layers' is really good advice. I wish you a great time in Oslo! If you have any other questions, please feel free to ask. 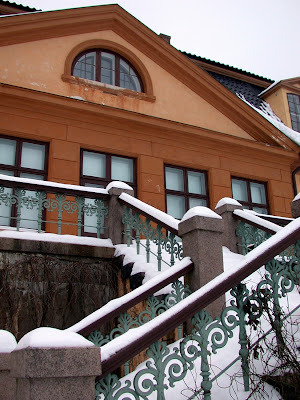 Another winter picture from the Bogstad estate, this one a closer look at the stairs from yesterday's picture. 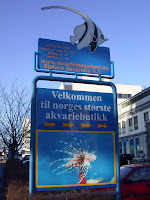 This place is in Oslo, but quite far from the center of town. I've always loved the building and the park outside. I've been away on a short holiday, visiting a town called Hamar. It's about 1,5 hours by train, so it's not far from Oslo. There, I visited the Medieval Cathedral from year 1152/53, protected by some sort of huge "green house". It was after hours, so I didn't enter, just took some photos through the windows. It's quite nice there, so I'd like to go back when I return to Hamar. Quote found at Otaku Desu! Another glimpse of winter for you. I don't really enjoy the winter. 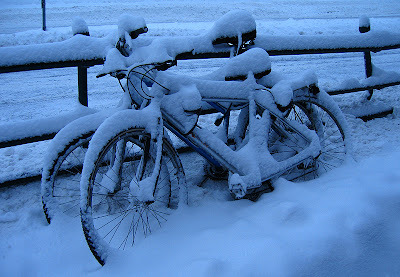 As I've earlier told Kristie, winter in Oslo means sudden shifts from cold to mild weather - and then to colder again. 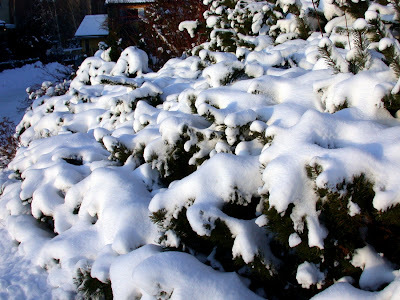 This means that if we do get snow, it usually melts quickly, then it freezes and it gets dangerously slippery outside. I truly hate that... deeply. BUT - when we do get snow and it stays cold enough for it to stay as snow - and it looks like in the photo above - I actually can enjoy the winter. 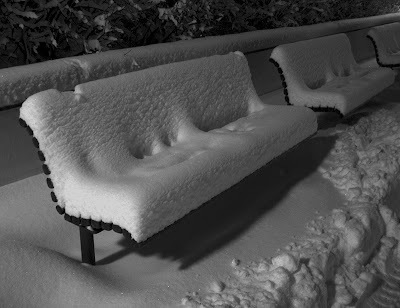 It's quite beautiful, of course, but something else I kind of forget from year to year is that the snow muffles sounds. 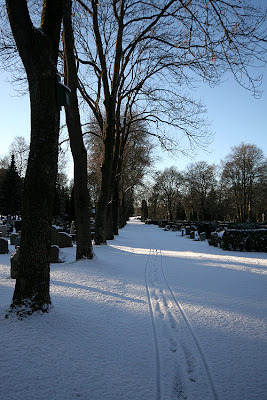 Going out after (or during) snowfall has a special feeling to it; Everything feels quiet. 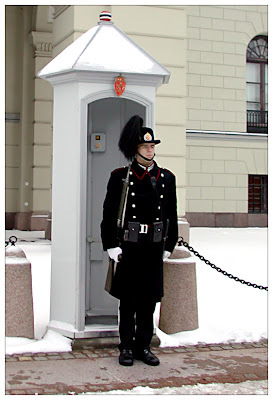 This is one of the royal guards standing in front of the castle. Probably a cold and unpleasant job during winter. This is the last of the nightly views, at least for this time. 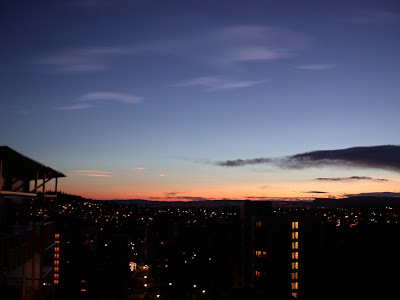 In this panorama (put together by my son's camera, it consists of 4 or 5 photos), you can see large parts of Oslo seen from the west. Click to enlarge. Another view from my balcony. I love the lights in this one. Since 2008 has just began, I thought this photo appropriate. It's taken an early morning and is a view of the center of Oslo. Happy new year, everyone! Here's our choice of today's Theme Day. 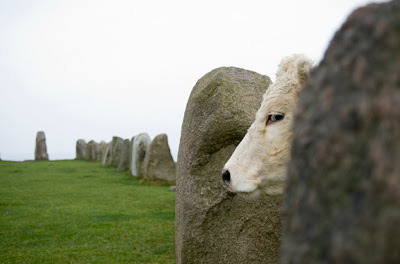 We'd like to point out this photo from Ystad Daily Photo as our favourite!